Every bride wants to look her best and most beautiful on that special day she's been dreaming of her entire life -- her wedding day! She meticulously prepares herself for this day so that she could look absolutely stunning, gorgeous and blooming. She is expected to radiate a certain aura that exudes grace, finesse and charm which could light up the entire wedding venue. This can only happen if (aside from marrying the person she loves, of course) she's comfortable and confident in what she's wearing and if she stays true to herself and her style. A lot of brides go for a traditional wedding attire, the whole white gown with lace and sparkles enchilada. Some choose this because they think it's the only way to go and that weddings are supposed to look and be like this. Stop right there! If you're going to be just like any other bride you see on magazines and TV, where's the meaningfulness in that? Your wedding should represent the kind of couple you are and what you love about each other. It's not just for show! You don't have to blend in like the other brides, you should be exactly who you are! If camouflage is a huge part of your lives, shouldn't you spend one of your most special and memorable days wearing it? Go for something unique and totally you -- wear a camo wedding dress! Now you might be thinking twice about this since it'll be hard to secure a dress that's not cookie-cutter! It's going to be a challenge deciding on a camo pattern you like and a design that shows just enough of the print you want. Some want an all-camo gown while others just want it on the trimmings and other small detailing. We understand your concern. That is why Camokix has rounded up a few of the best online and wholesale stores that cater to a camo bride. photos are taken from their website. Photo credits to owner of photos. 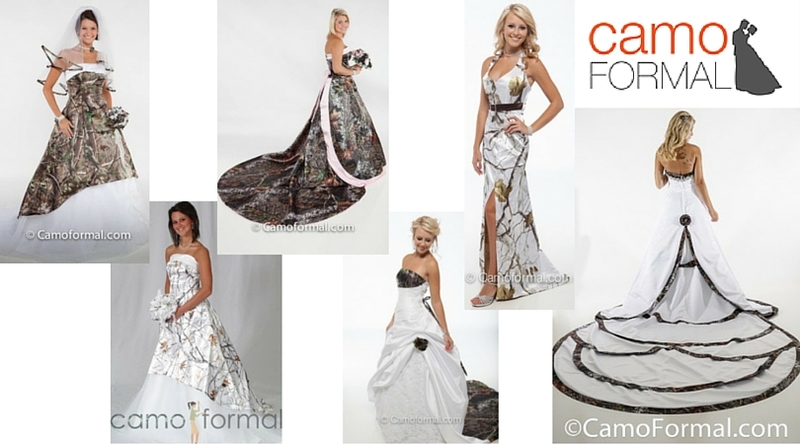 Camo Formal is an online shop that makes bridal, wedding, and prom dresses and tux vests. They have been in the formal manufacturing business for 30 years. For camo prom, homecoming, winter formals and wedding dresses, you can select from Mossy Oak New Break up™, Mossy Oak WINTER, True Timber White and Pink Snowfall, Reatree APG, Realtree MAX-4, Realtree AP SNOW, Realtree AP PINK camouflage fabric patterns. Camo Formals can be ordered in sizes 2-30 and coordinating children's camo wedding vests, ties, and other camo-accented clothing is available for rush delivery. Customized options are available for most items. Camo Formal dresses are MADE IN THE USA and we ship to all states and Canada. Their factory is located at 5115 Shreveport Hwy Suite 3 Pineville, LA 71360. You can contact them by phone from 8 am to 5.30 pm CST. Just dial (866) 226-6370. You can also check out their Facebook page. The Realtree Store is another online store where you can spot camo wedding dresses and formal wear. They do not, however, sell these products on their website. Realtree markets and licenses their camo patterns to product manufacturers who make custom formalwear for special occasions like Camo Formal and The Formal Sportsman. You can find other Realtree dealers online or near you who makes and sells specific Realtree camo products. Their physical address is at Realtree 1390 Box Circle Columbus, GA 31907 and you can reach them through this number: 1-800-474-8733. A TOUCH of CAMO provides camo accented wedding gowns, bridal attire, bridesmaids, prom, flower girls, and formal mothers dresses and gowns. Also, vests, ties, cummerbunds and more for men and boys. Main camouflage patterns on satin fabric are Mossy Oak New Break Up and True Timber White Snowfall but there are TEN other traditional camouflage patterns, plus the True Timber Blue and Purple Camos and the Moonshine line of camo to choose from, too. They also carry attire from Wilderness Dreams and Camo Diva, and their items are almost always in stock for immediate shipping. The owners of A TOUCH of CAMO is JoAnne & Gregg Schnepp. They are located at PO Box 810, Lakeside, Arizona. You can reach them through this number: (928) 368-85929 or email them at JoAnne@ATouchofCamo.com or jgschnepp@cableone.net. Also check out their Instagram and Facebook pages. We found Camo Gowns and More on Etsy. It is an online shop owned by Ginger Teeter-Hopwood who is based in Springfield, West Virginia, United States. With a great selection of camo formal dresses and wedding gowns, you can pick one design and choose any of the available camo patterns they have that you love. See more of their creations and designs on their Facebook page. Here's another online shop which offers a gorgeous camo wedding gowns. Weddings by Becky has been in business for 19 years and more than 23 years in the wedding industry. Located at 296 W Sunset Ave-Suite 10♥ Coeur d Alene, ID 83814, this online shop offers services unlike any other bridal boutique. They have the experience and expertise to help you put together a beautiful and affordable wedding! If you want a Mossy Oak New Breakup camo wedding, bridesmaid and flowergirl dresses in True Timber, Realtree and more camouflage patterns, they can help you out. The shop also offers wedding and reception packages as well as rental items. You also have an option for an easy payment plan. You can contact them through this number: 208-661-0261, or email them at weddingsbybecky@gmail.com. Lady Camo Bridal specializes in camo bridal dresses, camo bridesmaid dresses and men's attire featuring a wide selection of camouflage patterns on satin. Two of their most popular patterns include Mossy Oak New Break Up™ and True Timber Snowfall™. They also have formal attire for the children and accessories with camo. Plus, their camo formal attire is proudly made in the USA. You can even receive rush delivery and they ship all over the United States and in Canada! Their physical shop is located in the Twin Cities' (Minneapolis & St. Paul) South metro area in Burnsville, Minnesota. They are available by appointment only, so be sure to set an appointment earlier on. For more information, you can email them at leisha@pearlsandlace.net, or give them a call with this number: (952) 641-6467. If you're looking for a camouflage wedding dress, Weddings in Camo, offers a beautiful line for you. They produce everything in house to ensure that all their products are of the best quality. The sizes go up to Women's 32 and Men's 5XL because their main focus is the quality and fit. You can also have it customized, if you don't find a style and size that's right for you. Follow them on Facebook to know what's new with Weddings in Camo. This store's goal is to give you a single place to do all of your shopping for your wedding party's needs without having to search racks upon racks in stores. It's their mission to make your special day match what you've been dreaming about since falling in love. Brooke and Joni Van Sickle are the heads of the creative/techincal design team. Their studio is located at 6147 Hwy T12 North, Newton, IA 50208. You can reach them through this number: 641-792-4249 or email them at weddingsincamo@gmail.com. photos are taken from their website and on Pinterest. Photo credits to owner of photos. Carrafina Bridal blends the sophistication of the modern bride with the classic elegance of the traditional bride utilizing exquisite fabrics, superior construction and unique styling. They use licensed camo for wedding, prom and occasion gowns. Carrafina gowns are exclusive, found in only the finest, most reputable bridal salons worldwide. This means that their gowns are sold exclusively through retail brick and mortar stores to ensure the authenticity of their designs. If you are interested in their gorgeous gowns, go ahead and search for a retail store near you. Camo Diva is a wholesale online store that is especially for the ladies who love camo! They have camo dresses and gowns, women's military camo fashions, camo fashion shirts, camo lingerie, camo swim suits, camo casual and lounge wear, women's camo active wear, ladies camo hunting clothes, camo accessories, men's wear and accessories, camo fabric and ribbon, camo gifts and even camo party ware. You can search online or find a retail store near you. For more information, email them at info@CamoDiva.com or give them a call through this number: 260-417-3362. They are open from 9 am to 3 pm, Mondays through Fridays. You can also mail to this address: 2415 W. Shoaff Rd, Huntertown, IN 46748. So there you have it! The only problem now is choosing the perfect dress from among all these wonderful dresses. And remember, if you're a huge country girl at heart who loves the outdoors, hunting and camo, stay true to what's in your soul and have a kick of camo in your wedding dress! For camo wedding rings to match your awesome camo wedding dress, check out our website at www.camokix.com. We exist to help you find the perfect camo, country, hunting, or outdoor inspired rings for your big day or anniversary celebration.